The Rainbow Collision (Ciudad magazine, Oct./Nov., 2005): Tensions erupt between African-Americans and Latinos on Los Angeles streets. Dead of Night (Ciudad magazine, June/July, 2007): A look back at the Night Stalker's murderous reign of terror in the summer of 1985. The Other Side (Ciudad magazine, Feb./March, 2006): An examination of Latinos who vociferously oppose illegal immigration. The Gentle Beast (Ciudad magazine, Aug., 2007): A profile of Ultimate Fighter Tito Ortiz, who overcame a hardscrabble childhood to become a champion in a controversial sport. Desolation Boulevard (LA CityBeat, Feb. 5, 2004): A pre-Steve Lopez feature about the intractable conditions for the homeless people living on L.A.'s Skid Row. A Turbocharged Obsession (Los Angeles Times, Jan. 22, 1997): The first mainstream look at the import-racing scene that would inspire the Fast and the Furious movie franchise. Gangster's Paradise Lost (LA CityBeat, Nov. 6, 2003): A different angle on the gentrification of L.A.'s urban Westside; decades-old gangs face extinction. A Shadow on the Waves (Los Angeles Times, Sept. 26, 1994): The rarely-told story of a mythic wave-charger who changed the sport of surfing by inventing the modern board. Boomtown (LA CityBeat, Nov. 18, 2004): The gleaming resurrection of downtown represents a new era for Los Angeles, but leaves working-class residents in the dust. Sample This! (LA CityBeat, Oct. 14, 2004): A little-known court ruling outlaws most sampled music in hip-hop, dance and beyond, but artists find creative loopholes. 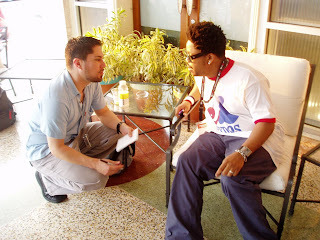 Above: Dennis Romero interviews electronic musician Felix Da Housecat in Miami in March, 2003. Photo by Eddie Lin.